Mental functions can be either conscious or subconscious. The conscious mind consists of thoughts you are easily aware of. They take place when you’re awake and choose to apply purposeful attention to what is happening and what you want. The subconscious mind consists of everything else such as habits, reflexes, cravings, coordination, and many forms of cognition that happens without you knowing even during sleep. Thought patterns fall in between the two: they can be conscious but also habitual and involuntary. Having negative thought patterns whether conscious or not, has a direct impact on behavior and will hinder you from living the life you want. Thankfully, there is a solution. Your conscious mind is a very powerful tool. It can even reshape your subconscious beliefs. Conscious thoughts can gradually shift your habitual mindset, allowing you to flourish. 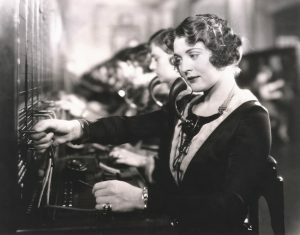 The Switchboard Operator is a useful visualisation technique to systematically change your thought pattern and is based on Cognitive Behaviour Therapy (CBT). Watch this short helpful video about CBT from one of my favorite mental health charity in the UK, Mind. Imagine that you are in a switchboard room trying to find the right telephone connection. There are many cables, all tangled up with one another. And there are also many entry points to connect to. The cables represent your thoughts and emotions. The entry and connecting points represent triggers and outputs. Nothing is the room is labeled. A trigger comes in via a random cable and creates an emotional response that impacts your behaviour. Sometimes multiple triggers buzz and you’re busy trying to keep up. The only way to get on top of things will be to work out what does what, why and how by meticulously testing it out one by one. Your job is to get to know your internal switchboard better. In other words, how your thought patterns impact you. We will look at situations where what you think either blocks or interferes with your positive intention to achieve something you want. By paying conscious attention and slowing things down, we can sort the cables and connect thoughts and feelings into desired responses over habitual ones. You will listen in on the existing wiring by paying attention to your body. Become aware of a thought that is getting in the way of what you want to achieve or how you want to be. This could be a belief you currently hold or a habitual thought that shows up. Recall this thought and focus on the feeling it creates within you. Fell this feeling as fully as possible. Pay special attention to how your body is affected by it. Do this in a conscious and deliberately mindful manner. It often helps to adopt the position of a compassionate and curious observer standing to one side simply noticing what is happening. If it helps you, you may wish to draw the current circuit of thought and resulting feeling/body sensation or write out your observations as a short narrative. How does your current switchboard misfunction? Then, describe or draw how you want to be feeling. Connect with this feeling in your body. Keeping the positive feeling in mind and feeling it, notice what thoughts and/or memories help you connect with this better feeling? Here are actual answers from one of my clients when we did this exercise together. The task of “completing an application I need to do” is a thought that overwhelms me at the moment. It feels heavy and burdensome to contemplate writing it. The thought makes my stomach constrict and I feel weak in my body. When I draw a simple circuit between the application and my thinking about it (input) and how it makes me feel and what happens as a result (output), I see it’s not a good switchboard. The current link is definitely disempowering. I have been procrastinating for months. I want to feel positive and motivated to sit down and just start! Here are actual answers from another client doing the same exercise. I feel compelled to check it all the time. This is incredibly distracting and keeps me away from what I actually need to be doing! I feel sick as soon as I realise I’m checking e-mail but then I just feel bad about myself. I lose focus and so I end up postponing what I should be doing to another day. I don’t need to draw this. I live this on a daily basis. I want it to stop! It is interfering with me being productive and I’m in a new role. I worry at night that I’m already falling behind with key deadlines. What I want is to come to work and tackle what’s important and not be tempted to check e-mail. It is easy for wires to get mixed up and disorder ensue during periods when the switchboard gets too busy. Quiet reflection time provides a much-needed pause to help put things back in order. With practice, you will find that you can train your mind to observe your thought patterns more and clear up your switchboard. This simple practice of slowing down to observe what is happening in your mind, heart, and body will help you self-correct. You can also go further. Our Da Vinci Programme is designed to raise your self-awareness and introduce you to many practical tools based on reconnection of mind, heart, body, and spirit. They help you face modern life demands more grounded and resilient. The programme is packed with short, practical, monthly tutorials, workouts, drills and missions to help you discover these insights for yourself. By following along over 13 months you will progressively help yourself become more clear, focused, grounded and creative. If you feel ready to explore your inner workings then Da Vinci is a great way to do that.